Has worked with Franck Goddio since 1999. Alexander received his first degree in Physical Oceanography from Moscow University and then worked at the Institute of Oceanography in Moscow, studying mathematical models for waves and currents. He decided this work was too boring for him … and in 1997 he visited the ‘Vasa’ shipwreck museum in Stockholm, which stimulated his interest in underwater archaeology. Alex then studied Greco-Roman history at the Centre for Egyptological Studies at the Russian Academy of Sciences. 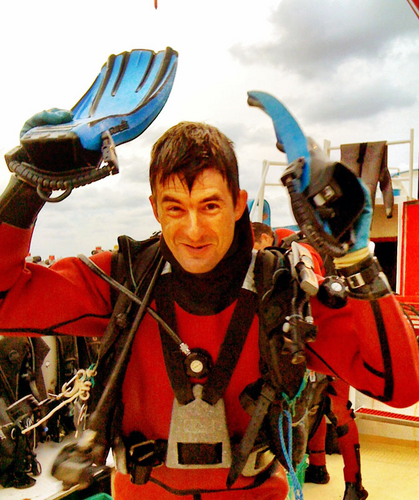 He is currently studying shipwreck 17, which was excavated at the site of Heracleion, as part of his Doctorate at University of Bordeaux, France. For the Russian Institute of Archaeology in Cairo, Alexander has participated in numerous excavations of submerged cultural heritage and has acted as the Project Manager on several projects, including surveys of the Black Sea for submerged Greek settlements and shipwrecks and on Egypt’s Northern Coast off Marsah Matruh.